← Less than 20 Days! A Final Touch Up for your ICD-10 Readiness! 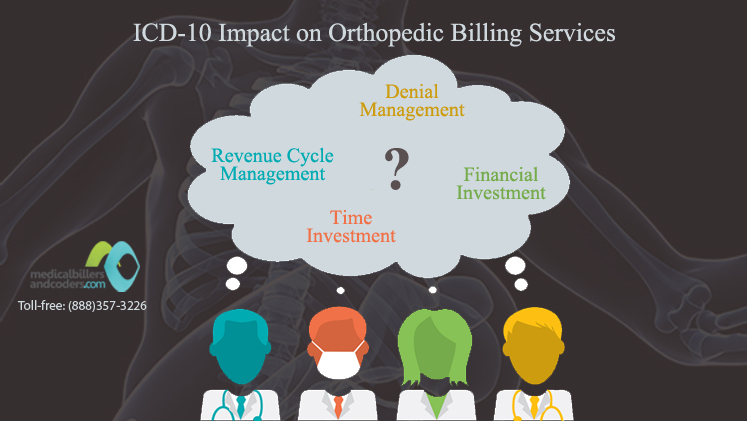 The far reaching effects of ICD-10 will have to be understood by all in healthcare in order to deal with the impacts. Revenue Cycle Management: Failing to keep up with changing payer rules and fees schedules can have a negative impact on the revenue cycle processes. It has been stated that nearly 25 percent of medical claims show rejection of which 15 percent are never resubmitted. Clinical Documentation: Accurately documenting along with selecting appropriate ICD-10 codes that support diagnosis reporting and the medical necessity for the service provided is very much required in the new coding system. This will take more investment in terms of time. According to the Medical Group Management Association, the time required for documentation will increase by at least 15 percent. Financial investment: In addition to time investments, orthopedic practices will also have to incur costs for updating electronic claims submission procedures under HIPAA from American National Standard Institute (ANSI) 4010 to ANSI 5010, which might already be underway. But before orthopedic practices start billing the DME services for Medicare patients, one needs to be aware of the 2 Federal laws, the Medicare/Medicaid Anti- Kickback Statute and the Stark Act. DME billing can bring in large revenue, but the amount varies with product and state. So if your orthopedic practice cannot dispense Durable Medical Equipment, Prosthetics, Orthotics and Supplies (DMEPOS), see to it that you can arrange to have a Durable Medical Equipment Regional Carrier (DMERC) license to dispense covered items for Medicare patients and you can start making profits. This entry was posted in Accounts Receivables, DME Billing, ICD-10, Medical Billing, Orthopedic Billing. Bookmark the permalink.